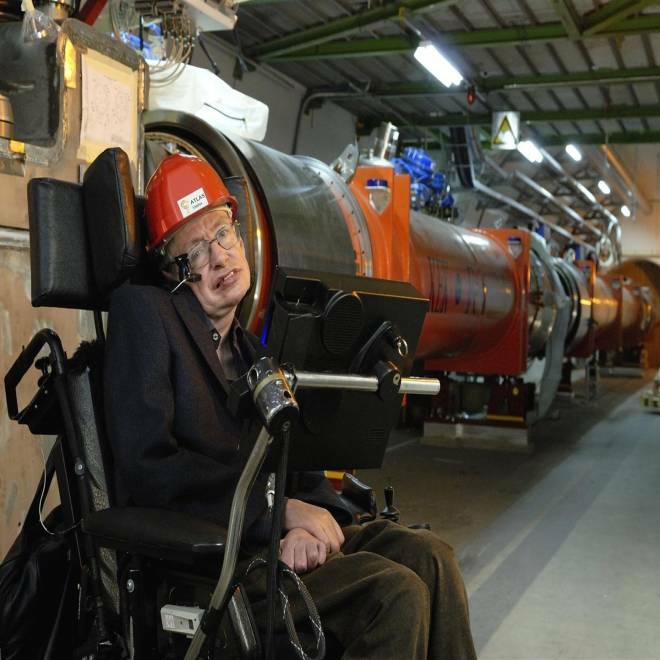 Famed physicist Stephen Hawking visits the Large Hadron Collider's underground tunnel in 2006. He bet against the discovery of the Higgs boson but is now willing to pay up. When it comes to betting on cosmic outcomes like the discovery of the Higgs boson, British physicist Stephen Hawking is a three-time loser. But there's a good reason for that. Hawking's latest loss was to Gordon Kane, a theoretical physicist at the University of Michigan who worked out some of the ways that the Higgs boson could be detected in a particle-smasher like the Large Hadron Collider. About 10 years ago, Kane was discussing some of the issues while he and Hawking were together at a physics conference. "Stephen interrupted, and said he would like to bet me that there was no Higgs boson," Kane recalled today. It took a while to work out the conditions of the $100 bet, and at one point things looked so dim for the search that Kane sent Hawking a check, according to The Detroit News. But this week, when researchers at the LHC announced that a subatomic particle matching the Higgs boson's general description had been discovered, it was Hawking's turn to concede the bet. "It seems I have just lost $100," he told the BBC's Pallab Ghosh. Kane told me he's heard from several third parties that Hawking is acknowledging his loss, but said Hawking himself "hasn't sent me anything yet." He figures that Hawking will eventually make good on the gambling debt. "The important thing is the discovery of the Higgs," Kane said. "But it's fun to win a bet from Stephen, and I'm guessing he doesn't mind losing a little money." This isn't the first time Hawking has lost a small-stakes, high-profile bet on a scientific proposition. Back in 1975, he bet Caltech physicist Kip Thorne that there was no black hole at the center of the X-ray source known as Cygnus X-1. By 1998, he conceded that the black hole was there, and got Thorne a year's subscription to Penthouse magazine as a payoff. In 1997, Thorne and Hawking bet Caltech's John Preskill that information is completely lost when something falls into a black hole. But in 2004, Hawking changed his mind and said that information could conceivably leak out of a black hole. Hawking paid up by sending Preskill the repository of information he requested: a baseball encyclopedia. At last report, Thorne had not yet conceded. There's another wager still pending: Hawking is betting that primordial gravitational waves will be detected, resulting in the confirmation of inflationary big-bang theory. The Perimeter Institute's Neil Turok, a proponent of the cyclic model of cosmic origins, is betting against him. "If these gravitational waves are seen, they will instantly disprove our model," Turok told Cambridge professor Alan Macfarlane. The terms of the bet, however, are still under negotiation. So, as far as we know, Hawking is 0-for-3, with one bet still up in the air. That led the BBC's Ghosh to joke today in a Twitter update that "research effort could be saved if we knew what other bets Prof. Hawking has placed and assume he'll lose." The only bet that I'm sure Hawking has won is the poker hand he played on "Star Trek: The Next Generation." And that was written into the script. The opening scene from an episode of "Star Trek: The Next Generation" in which Data plays poker with Stephen Hawking, Isaac Newton and Albert Einstein. Is Hawking really that bad at anticipating future developments in physics? Not really. The guy just bets with his heart, not with his head. In the case of Cygnus X-1, for instance, he was actually glad to lose the wager. "This was a form of insurance policy for me," he explained in "A Brief History of Time," his bestselling book. "I have done a lot of work on black holes, and it would all be wasted if it turned out that black holes do not exist. But in that case, I would have the consolation of winning my bet." The bet about the fate of information in black holes was a true cosmic conundrum, and Hawking decided to go along with the more conservative of the two alternatives, even if it meant buying an encyclopedia for Preskill. If Hawking stuck to his guns, he would have to maintain that the information in black holes disappeared into other universes. "I'm sorry to disappoint science fiction fans, but if information is preserved, there is no possibility of using black holes to travel to other universes," he said in 2004. "If you jump into a black hole, your mass energy will be returned to our universe, but in a mangled form, which contains the information about what you were like, but in an unrecognizable state." As for the Higgs boson, Hawking was hoping that there'd be a less orthodox and more elegant mechanism to explain how it is that some particles have mass while others don't. Finding the Standard Model Higgs boson, and nothing else, would be a disappointing outcome — as fellow physicist Stephen Wolfram pointed out in a blog posting today. So once again, Hawking was betting with his heart. "If the decay and other interactions of this particle are as we expect, that will be strong evidence for the so-called Standard Model of particle physics, the theory that explains all our experiments so far," Hawking said. "This is an important result, and should earn Peter Higgs the Nobel Prize. But it is a pity, in a way, because the great advances in physics have come from experiments that gave results we didn't expect." If it turns out that the particle revealed this week is a non-Standard Model Higgs boson, Hawking might still be able to hang onto his $100, and the cosmos will get that much more mysterious. But in any case, Kane is moving on to the next big thing: supersymmetry, the idea that every one of the subatomic particles we've detected to date has a weird twin we haven't yet been able to see. Such a concept could explain the nature of dark matter, which accounts for far more of the universe than the ordinary matter we see around us. As strange as it sounds, Kane thinks it's possible to find evidence of supersymmetry — and he's willing to put his money where his mouth is. "I'd love to have bets on supersymmetry," he told me, "but no one will take them." Update for 2:30 p.m. ET July 6: Kane told me that it was premature to say what he'd spend the $100 on, but in a Reuters report, he said that "all funds go toward research." He also said that winning the bet was a very nice frosting on the cake" for this week's boson discovery. Reuters also quotes Scottish theorist Peter Higgs, one of the physicists who came up with the idea behind the field and the particle that now bears his name, as saying that he was tipped off about the discovery the night before Wednesday's announcement, during a champagne dinner with CERN researchers. On the flight home from the event, fellow physicist Alan Walker offered Higgs a glass of Prosecco sparkling wine — but Walker told Reuters that Higgs said, "I'd rather have a beer."